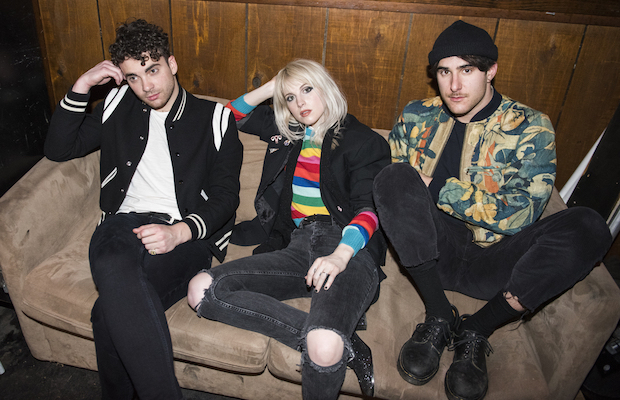 In, perhaps, their best televised performance ever, Nashville based alt rockers and site faves Paramore stopped by The Late Show with Stephen Colbert last week to deliver a quirky, retro, and inventive rendition of “Rose-Colored Boy,” the latest single from last year’s stellar fifth album After Laughter. Fresh off the third voyage of their curated rock cruise Parahoy, the band took inspiration from their newscaster-inspired video for the track, transforming the studio into an ’80s-esque wash of color, retro televisions, and oversized attire (which gives a nod to Talking Heads, among other influences), with camerawork and choreographed performance much more intricate and deep than your run of the mill late night stop. With that theme and context in mind, watching the band’s performance and especially singer Hayley Williams’ expressiveness highlights even more specific intent, eschewing the standard “show up and promote a single” motions in favor of using the opportunity to not only showcase what makes Paramore so unique and special, but also to speak to their audience and those who get what they do with a profound and emphatic message. Long a group rooted in sincerity and transparency, everything about Paramore’s latest musical chapter has felt like the most true to themselves and their roots in years, and with a stop on Colbert, they managed to bring that resonance and intimate feeling to a national platform. Watch below, revisit our reviews of their 2017 Ryman and Exit/In outings, and catch the group’s inaugural appearance at Bonnaroo next month. You can also see drummer Zac Farro (and most of Paramore’s live band) as HalfNoise this Sunday, May 13 at Exit/In. [NO COUNTRY PREMIERE] Listen to Dela Kay’s Electropop EP ‘Empty’ | See Her TONIGHT @ The Back Corner!